It’s been 40 years since Bernard Sadow slapped a set of wheels on a suitcase, essentially inventing the concept of rolling luggage and satisfying a need travelers didn’t even know they had. It was a game-changing innovation, and for marketing consultant Brian Sweet, who works with companies in the travel industry, the time has come for someone else to pick up where Sadow left off. “It’s an industry that’s just full of unmet needs,” said Sweet, which may explain the flurry of unique products now hitting the market. The eight below — some recently introduced, some still on the drawing board — may not revolutionize the travel industry, but depending on your style, one or more might be the next best thing. Why run to catch your plane when you can ride? 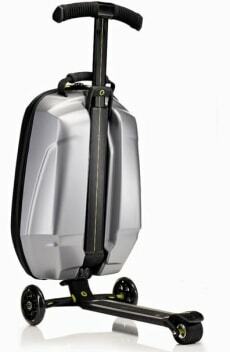 Set to debut early next year, the Micro Samsonite (£250, $403) is part hardshell case, part kickboard-style scooter. Extend the integrated handle and tri-wheeled kickboard and you can glide right past the teeming hordes in the terminal. Once at your gate, reverse the process and you’ve got a carry-on bag with a capacity of 2,600 cubic inches. All it needs is a bell and a cup holder and suddenly that connection between gates A1 and Z99 is a breeze. Then again, maybe you prefer relaxing to rushing. If so, the Trip from Travelteq may be just the ticket. Crafted of burnished aluminum, this 22 X 10 X 14-inch wheeled case converts to a sturdy seat via spring-operated legs, a retractable handle/backrest and a sliding top plate/seat cushion. Order the standard model for €595 ($812) or step up to the Trip Sound (€650, $886), which features integrated speakers so you can share your music collection with the entire terminal. 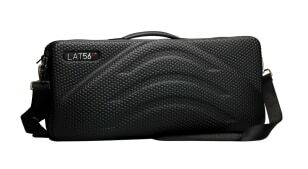 With its sleek profile and textured EVA-foam exterior, the new Red-Eye (£250, $403) from Glasgow-based Lat56° looks like it should hold an assassin’s high-powered rifle. 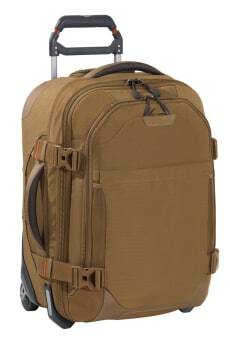 In reality, the 22 X 10 X 8-inch case is a garment bag for business travelers with a minimalist bent. Using a patented Torsion Protection System, it’s designed to keep a suit wrinkle-free and features a separate compartment for shoes, shirts and other essentials. Picture James Bond packing for his next mission — Brioni suit, Turnbull & Asser shirt, Walther PPK — and this is probably the garment bag he’d carry. How do you make a security-friendly laptop bag even friendlier? 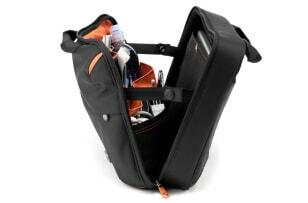 If it’s the Taipan Lift from Booq Bags, you outfit it with interior and exterior pockets for papers, chargers and personal items; a zippered outside panel so you can slip it over the handle of your rollaboard for hands-free transport and a clamshell design that lets you open it 180 degrees by unsnapping two buttons. The S model ($89.95) will hold a 14-inch laptop; the L model ($99.95) will hold a 17-inch, and both come with the company’s Terralinq lost and found reporting service. It’s a shipping container! It’s a carry-on bag! 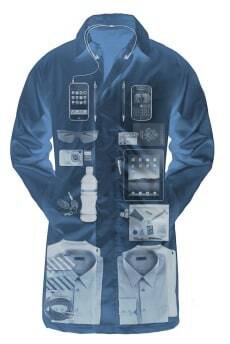 It’s, well, both and a viable option for the infrequent traveler on a budget. 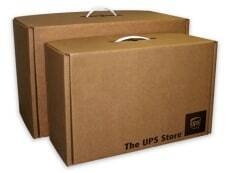 The Luggage Box from The UPS Store is a cardboard carton with a heavy-duty plastic handle that can be shipped, checked or carried on board. They’re available in two sizes — the small ($12.95) conforms to standard carry-on dimensions; the large ($17.95) has a capacity of almost 5,000 cubic inches — and they’ve been designed to withstand the rigors of at least two airplane trips. Fashionistas, take note: You can get it in any color you want — so long as it’s brown. According to designer Alberto Villareal, a principal at Mexico City–based Agent, today’s traveler is more of an “experience seeker” whose luggage should do more than just carry stuff. 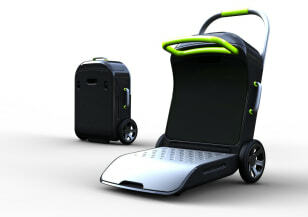 Consider, for example, the company’s three-piece Move On collection of wheeled suitcases. 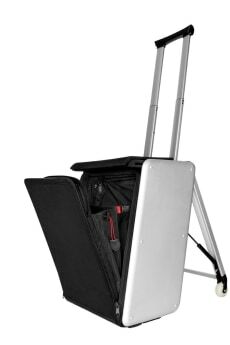 The Surfn (pictured) features a dropdown platform that can be used to haul other bags; the Ridn does double duty as a mobile seat, and the Strolln is what you get when you cross a suitcase with a baby stroller. Alas, all three are just prototypes at this point, so chances are you won’t be surfin’, ridin’ or strollin’ any time soon. Finally, for the dapper traveler who doesn’t want to deal with bags at all, there’s the latest offering from Scott Jordan, the man who brought you the 22-pocket, all-you-can-haul ScotteVest. Just in time for winter, the new, trench-style SeV Carry-on Coat ($225) features 33 pockets that are large and varied enough to hold everything from a water bottle and iPad to dress shirts and a pair of shoes. Fully loaded, you may resemble a shoplifter on a holiday spree, but hey, it beats paying 25 bucks to check a bag every time you board a plane. Rob Lovitt is a frequent contributor to msnbc.com. If you'd like to respond to one of his columns or suggest a story idea, drop him an e-mail . Send Rob Lovitt an e-mail.